This is a collection of case studies of patients, mainly from the 1850s (there are also notes on some First World War patients). 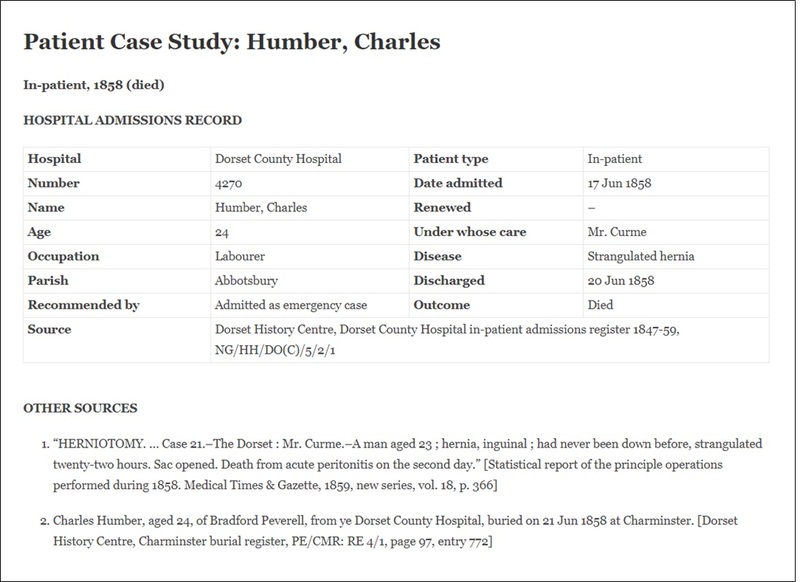 The Victorian case studies add more detail to the entries in the admissions registers. The main data source is a series of short reports submitted by the hospital’s surgeons to the Medical Times and Gazette. These have been supplemented with information from census returns, burial records and newspaper reports. There are also a small number of medical cases, based on articles written by the hospital’s honorary physician, and published in the medical press. Click on the red links below to read the relevant case studies. The amount of information available differs from one individual to another. Those marked with an asterisk (*) will be published shortly.